Just like Mountaine Meadows plaques, these Little Dishes are lovingly handmade of all natural and recycled materials, by Deborah and her staff, in our Vermont studio. Use Mountain Meadows Little Dishes to hold spoons, teabags, small soaps, paperclips, rings, etc. 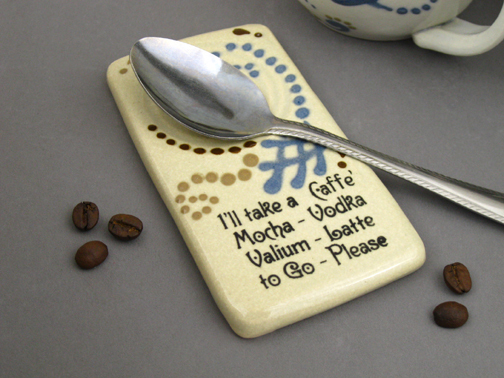 The perfect place for your spoon when making your morning coffee. Mountain Meadows Little Dishes are dishwasher safe. Add a little whimsy to your diner party by placing Little Dishes on your table. The sayings Deborah has chosen are special because of the way they speak personally to the important people in our lives, making them smile and laugh. This Little Dish makes a great hostess gift. All our products are created from soft pliable clay that is mixed here, in our Vermont Studio, and formed by hand. Each individual Little Dish is hand decorated with forms inspired by musical notation, cosmic spheres and astrological imagery. 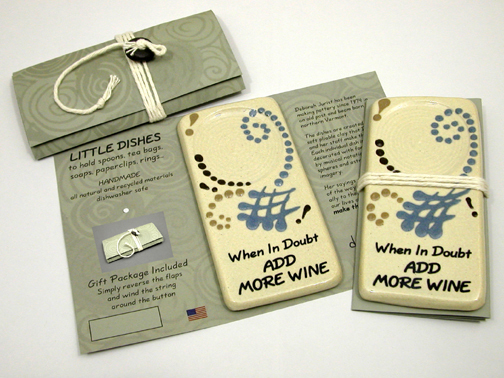 Little Dishes made by Mountain Meadows Pottery feature specially designed packaging with the gift wrap built right in. Watch the video in the link above to see how the packaging easily turns the Little Dish into a lovely gift that is all ready to give. The gift wrapper is built right into the packaging. 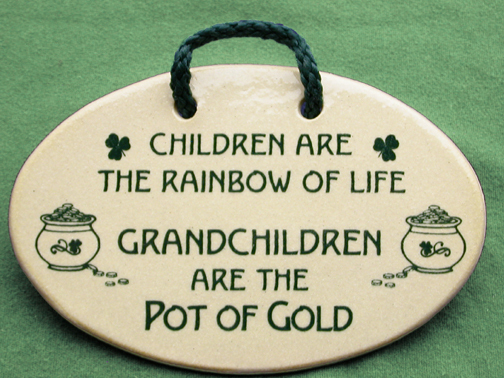 Mountaine Meadows Pottery understands that it is the prerogative of a grandparent to spoil their grandchildren. 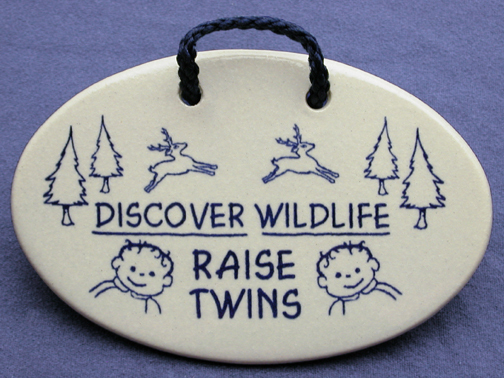 These Mountaine Meadows Pottery plaques are a fun unique gift for grandparents. 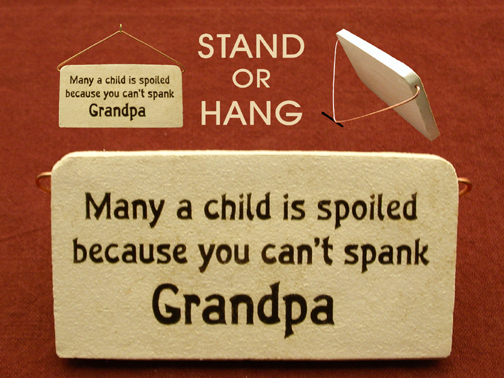 Father’s Day is coming on June 19th, don’t miss our other plaques for Dad and Grandpa. Mountaine Meadows has a great gift for the parents of twin! 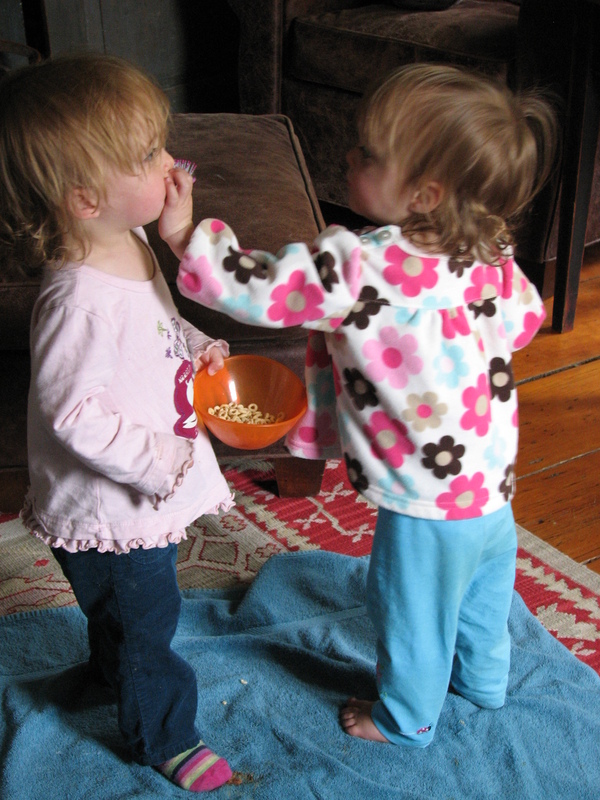 This cute twin saying was inspired by family friends with beautiful twin daughters. They came for a visit last weekend. We had a wonderful time experiencing the “wildlife” that ensued. The twins love for everyone to play "Ring around the Rosie"
Mountaine Meadows has a wide variety of gifts for family and friends. Looking for a bridal shower gift, wedding gift or anniversary gift? 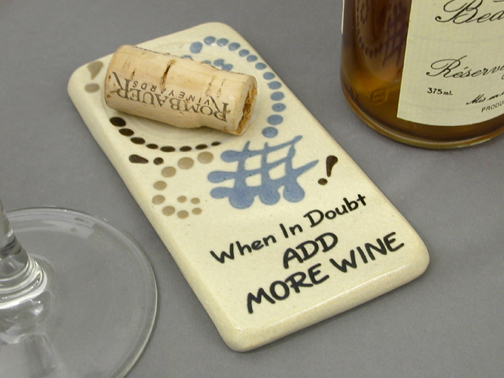 Here are some great ideas from Mountaine Meadows Pottery. Wedding season is upon us. 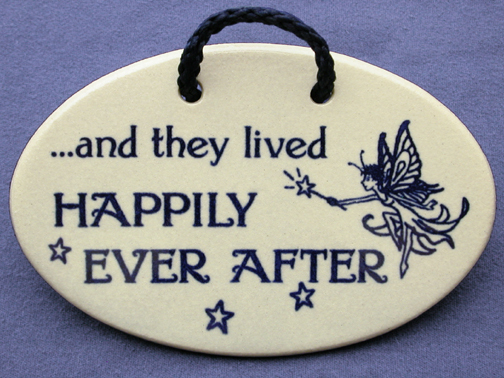 Here is a wonderful wedding gift for a fairytale wedding. 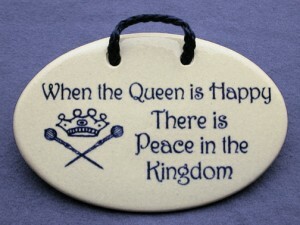 This plaque would also make a perfect bridal shower gift for your princess bride. This sweet saying also makes a great anniversary gift. Visit our website to see more wedding gift, bridal shower gift, and anniversary gift ideas. Perfect gift for Mother’s Day (May 8th) for under $20.00 is as easy as pie at Mountain Meadows Pottery. With Free Shipping on all purchases until May 2nd. Make MOM "Queen for a Day" this year, or perhaps she should always be the Queen. 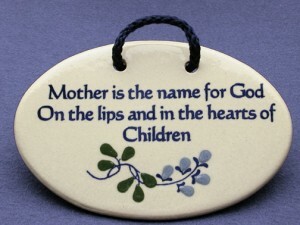 Or make her melt with the “Mother is the name for God on the lips and in the hearts of children” plaque. 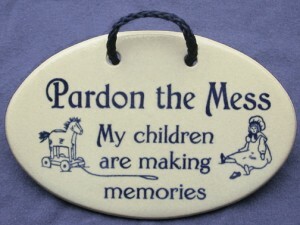 Make her feel at peace with a messy house with the “Excuse the mess my children are making memories” saying. 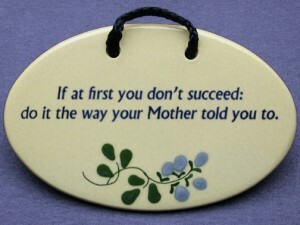 Remind her of how right she can be with the “When all else fails, do it the way your Mother told you” plaque. OK Admit it, sometimes Mom really does know best. Go to the Mother category at Mountain Meadows and find a full variety of great gifts for MOM. All for under $20.00 and there is free shipping until May 2nd. Plus we are offering Free Shipping until May 2nd. Mountaine Meadows is famous for its Irish plaques with funny sayings. 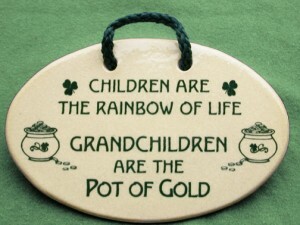 We have been making them for a long time and sayings about Irish Friendship and Grandchildren are a specialty. Now is the right time to visit Mountaine Meadows special section devoted completely to Irish Sayings and Quotes perfect for St. Patrick’s Day. There are 19 different sayings all with Irish quotes and imagery. Be sure to check out the Buy 3, Pick a Fourth and get it FREE! Gifts for St Patrick’s Day abound at Mountaine Meadows Pottery. There are fabulous humorous sayings as well as inspirational quotes about family and Irish Blessings. 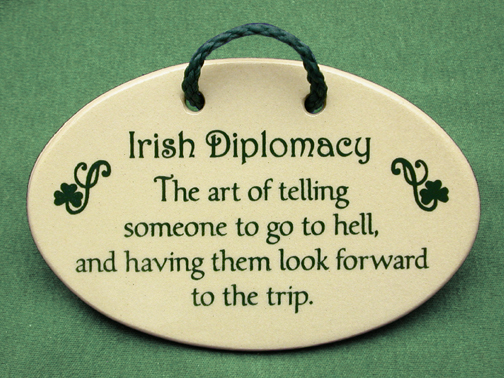 The Irish have many hilarious sayings. Mountaine Meadows has a fantastic selection of funny Irish quotes that are perfect for all kinds of people. 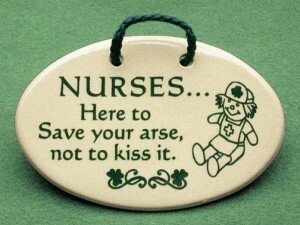 A Mountaine Meadows wall plaque could be the perfect gift for your Irish friend. There are sayings for Irish girlfriends and for the office. 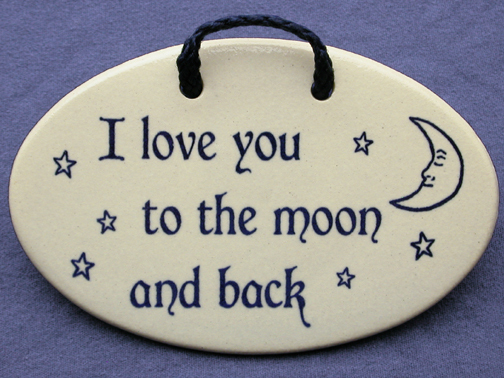 Go directly to the Irish plaques at Mountaine Meadows Pottery to choose your favorites. If you buy 3 you can pick a 4th and get it free. Mountaine Meadows funny sayings are perfect gifts for cousins. 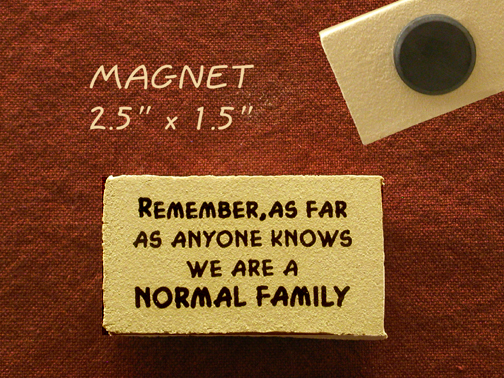 The “Remember As Far As Anyone Knows We Are A Normal Family” is cute and funny and under $20.00. Families make the best stories. 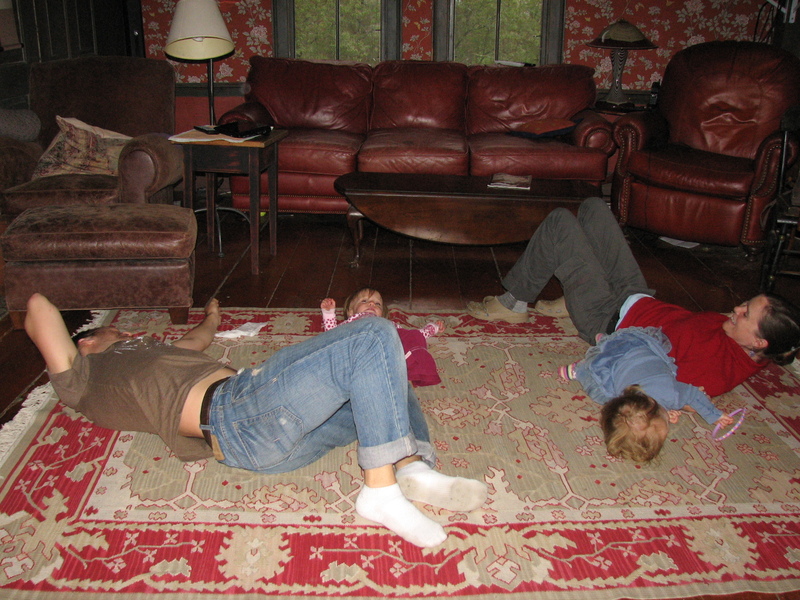 I found this Family Funny blog about funny family stories. 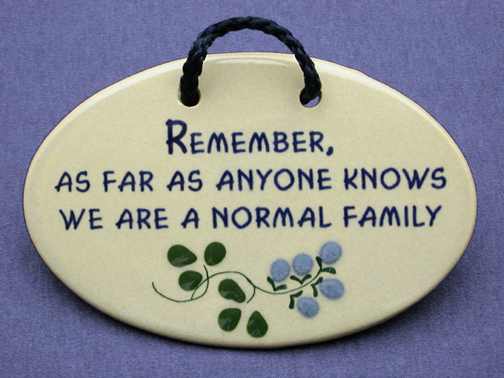 Remember there is NO such thing as a NORMAL family. 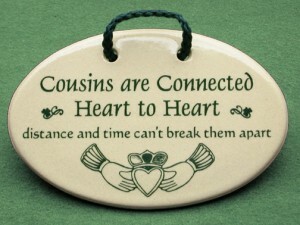 Mountain Meadows has the perfect gift for a far away cousin. 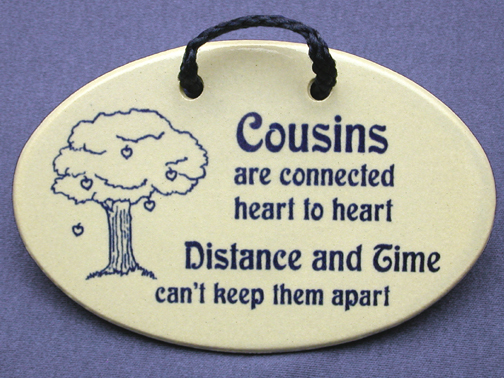 The apple tree image illustrates that all the family apples come from the same tree and the saying, “Cousins are connected Heart to Heart, Distance and Time Can’t Keep them Apart” is the perfect sentimental saying for cousins. Has your best friend moved away? 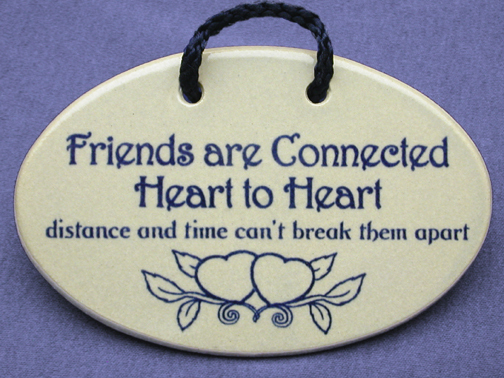 At $20, “Friends are connected heart to heart, distance and time can’t keep them apart” is a perfect inexpensive gift for a friend. 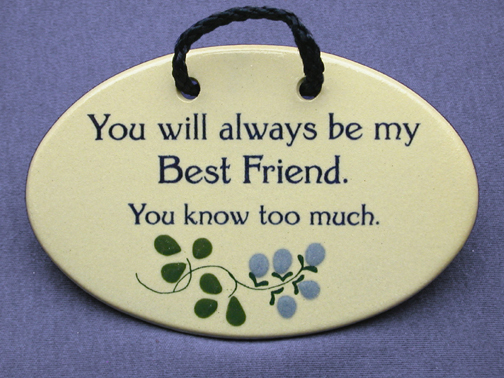 There are lots of funny, cute and sentimental gifts at Mountaine Meadows all for under $20.00. Check out the sayings for family, friends, and especially the great sayings for cousins. And remember when you buy three plaques you can pick a fourth and get it for FREE! Gift ideas for divorced friends can be a challenge. It can be especially hard when they are a recently divorced family. 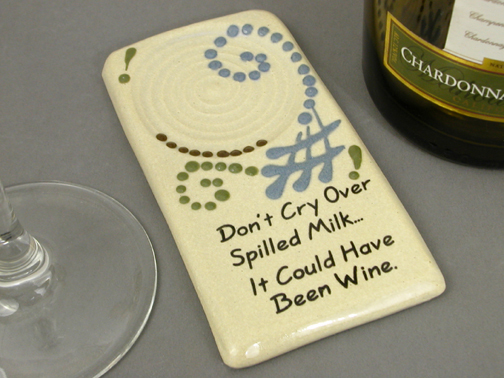 Mountaine Meadows has 5 funny and heartfelt gifts to give to just divorced person. 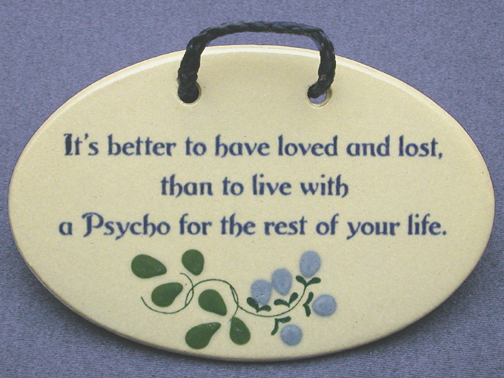 The plaque which says, “It is better to have loved and lost than to live with a psycho for the rest of your life” will make just about any newly divorced person laugh. It is also perfect and funny gift for a recently separated friend who might not actually be divorced yet. All Mountaine Meadows plaques are unique and creative and made by hand in our Vermont studio. The “It is not how fast you run or how high you climb but how well you bounce” plaque is a great gift for under $20.00 for a divorced friend who needs a little encouragement that they WILL bounce back. 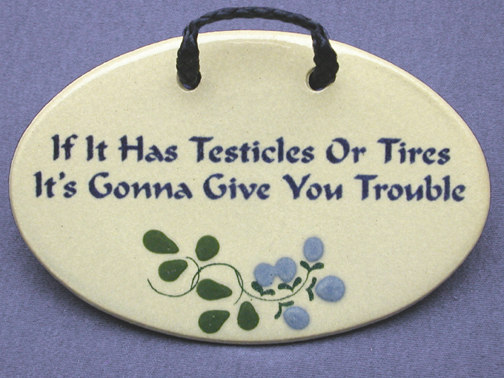 “If it has testicles or tires it is going to give you trouble” Here is a funny gift for a recently divorced girlfriend or even a married girlfriend who needs a good laugh. Whatever the situation girlfriends can all agree that if it has testicles it WILL give you trouble. Every girl needs a little encouragement when things get rough. But if she “puts on a little lipstick, she’ll be fine” This plaque gently encourages your girlfriend by reminding her that things can return to normal even after a divorce. The only way to face the future is to let go of the past. Here is a terrific gift for a recently divorced friend who needs a little encouragement, and it is tryly a poem! Yesterday is history, to morrow is a mystery that why we call it the present. Divorce is a hard thing to get through but the best help comes from other people facing the same challenges. Many of our customers have discovered great Mountaine Meadows plaques through the website divorce360.com. It is packed full of resources and information. Mountaine Meadows has tons and tons of great sayings for many different relationships and events. They are all only $14.95 and come packaged in a free gift box. Visit the Mountaine Meadows website for over 200 sayings.